Since December 21, 1989, the renovated bell-tower of the the Pilgrimfathers’ Church in Rotterdam-Delfshaven, has been graced by a new carillon. This was realised through donations from Dutch and American sponsors, as well as funds from Rotterdam. 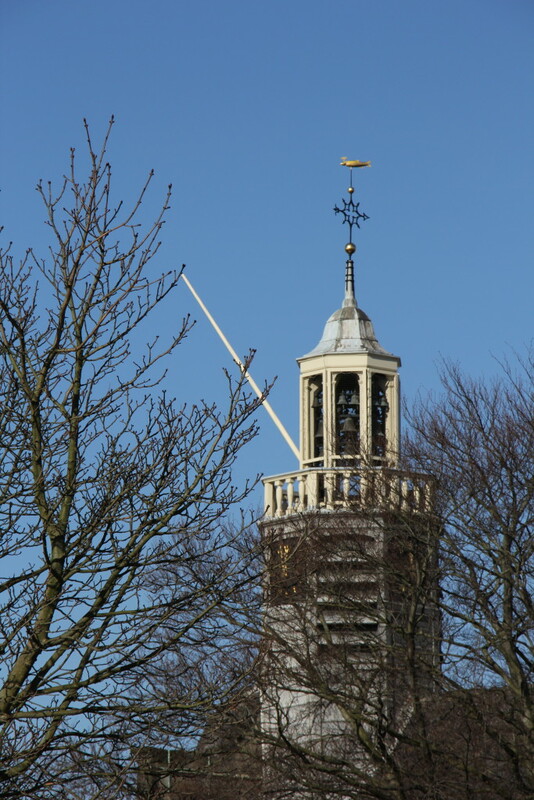 On that day the Committee Carillon Delfshaven officially handed the bells over during a solemn ceremony in the church to the Rotterdam city council. 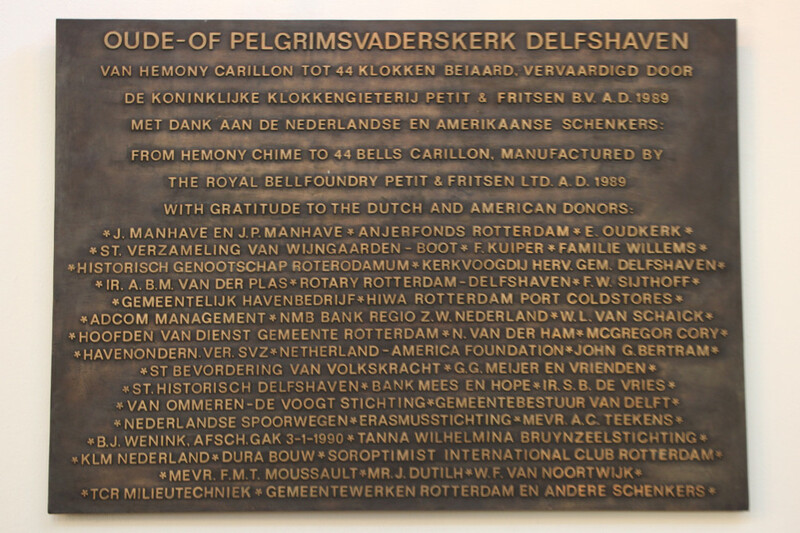 A group of people connected to circles such as Stichting Historisch Delfshaven (Foundation Historical Delfshaven), Muziek in Delfshaven (Music in Delfshaven) and from the world of listed buildings and carillons took the initiative to enlarge the existing carillon in the Pilgrimfathers’ Church, and to make it playable again. With special thanks to the efforts of W. L. van Schaick, chairman of the Stichting Historisch Delfshaven, this plan succeeded. The cost of the restoration of the old bells and the purchasing of new ones, the playing table and the necessary technical appliances came to approximately 240,000 guilders. Around 80,000 guilders could be covered by combining the work with regular maintenance. The remaining funds were collected from donations from citizens and companies. Each bell has been cast with the name it was given by its donor. “The new carillon tolls for the end of the celebrations commemorating 600 years Delfshaven, and rings in the festivities for 650 years of city rights for Rotterdam”, said alderman J. Laan, who accepted the carillon on behalf of the city council. 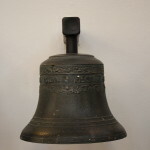 The new carillon was made by the world-famous firm “Koninklijke Klokkengieterij Petit en Fritsen BV” from Aarle-Rixtel and is unique in more than one respect for the Low Countries. The instrument consists of 44 bells. The largest sounds the tone E, and weighs more than 130 Kilos, with a diameter of 600 Millimetres. Of the 44 bells, 32 have been placed harmoniously in the eight openings of the belfry. 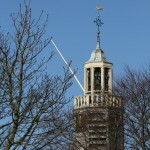 The three heaviest bells, as well as the nine smallest have been hung further inside the tower, and are less visible from outside. Carillon specialist Jaap van der Ende from Schoonhoven calls the compact build of the instrument unique for the Low Countries. This was possible by using incorrodible materials that require next to no maintenance, in combination with excellent access to the bells from the outside around the bell tower. The 25 lowest bells are played, automatically and computer-driven, on the quarter of each hour, while the largest bell is used to summon the congregation to church before the services. The new instrument both looks and sounds extremely sophisticated compared to what is currently the standard. The work in and on the actual tower was executed by the Rotterdam Council, to their design and plan, assisted by Rijksdienst Monumentenzorg (National organisation of the preservation of listed buildings and monuments) and Jaap van der Ende. The original attic was made suitable for the playing table to be housed, and from there, Geert Bierling, or others, can play the carillon and give concerts. 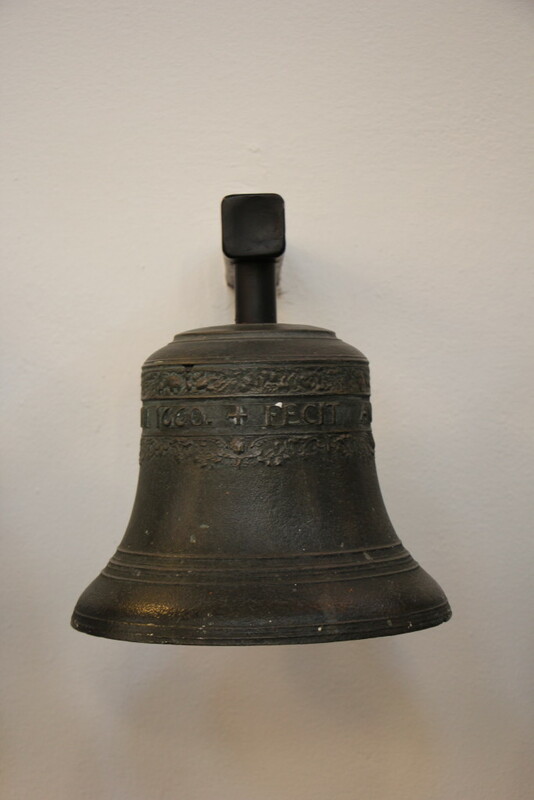 The old church bell, which is cracked, and the restored old Hemony-bells that were not used in the current carillon have found a space in the sanctuary of the church.